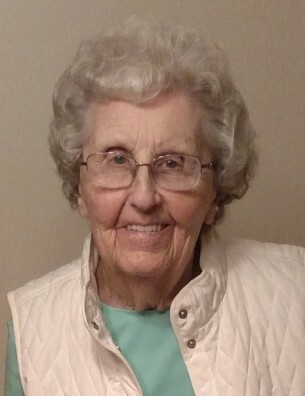 Marjory Eileen (Duhr) Cummings, 95, of Rockford, IL, died Thursday, January 24, 2019 peacefully at home with family. Born on December 13, 1923 in Richland Center, WI to Herman and Alice Duhr. Marjory married Robert Cummings on November 15, 1947 in Madison, WI. They settled in the Milwaukee area, raising four children. She was an avid card player and was the family champion of Yahtzee. Marge enjoyed family events and was always ready to play games with all generations of her relatives. She was a lifelong Brewers and Packers fan, watching every game she could. Survivors include her sister, Velda Duhr of Menomonie Falls, WI; three sons, Dennis (Jane) Cummings of West Allis, WI, Richard (Nancy) Cummings of Wautoma, WI, David (Pam) Cummings of Muskego, WI; daughter, Janis (Gary Downing) Drummond of Rockford, IL; seven grandchildren and nine great-grandchildren. Marjory was predeceased by husband, Robert and 10 siblings. Funeral service will be at 1:00pm with a Visitation from 12:00 noon until the service on Saturday, February 2, 2019 in Honquest Family Funeral Home with Crematory, Roscoe Chapel, 11342 Main Street, Roscoe, IL 61073. Pastor Dan Herman will officiate. Memorial luncheon to follow at American Legion Hall in Rockton, IL. Burial in Rockton Township Cemetery. In lieu of flowers, memorials to Heartland Hospice, 6000 E. State St., Suite 100, Rockford, IL 61108.